At Supreme Court, Debate Over Phone Privacy Has A Long History : All Tech Considered Wiretaps, messaging and metadata: If it reaches the Supreme Court, Apple's legal clash with the FBI would fit into a long discussion about the role of telephones in our lives. 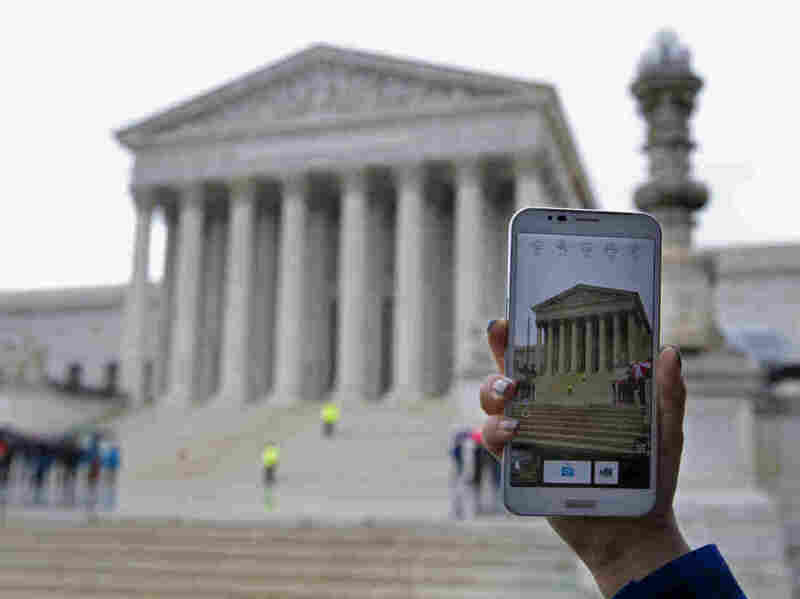 A visitor takes photos with her smartphone outside the Supreme Court in 2014, while the judges heard arguments related to warrantless cellphone searches by police. Underlying the debate over Apple's refusal to help the FBI unlock the iPhone of San Bernardino shooter Syed Rizwan Farook is the idea that cellphones hold the most intimate details of our daily lives. That wasn't always so obvious. As the role of technology changes, so have our attitudes, and one of the places to see this work in progress play out is at the Supreme Court. Take, for example, the 1928 case Olmstead v. United States, in which the Supreme Court ruled that wiretapping could be conducted without a warrant; then compare it with the 1967 case Katz v. United States, when the court essentially said the opposite. "The justices had phones [by 1967], and they knew that they talked about their most private stuff on those phones," says Jennifer Stisa Granick, director of civil liberties at the Stanford Center for Internet and Society. "So a case that considered warrantless wiretapping looks a lot different. ... And I think that same exact dynamic is happening here." It's unclear when or if the legal dispute over the San Bernardino iPhone will reach the Supreme Court, but the court's past opinions are informative as the Apple-FBI legal clash continues. Below are some of the key cases in which the top court has been asked to evaluate similar concerns. Back before the telephone was ubiquitous and pocket-size, the court ruled that wiretapped phone conversations were not a violation of the defendant's rights under the Fourth or Fifth Amendments. Why? In part, because the listening equipment was installed outside the houses involved. But in his dissent, Associate Justice Louis Brandeis outlined an argument that the court would face again: "The evil incident to invasion of the privacy of the telephone is far greater than that involved in tampering with the mails." "The Government stresses the fact that the telephone booth from which the petitioner made his calls was constructed partly of glass, so that he was as visible after he entered it as he would have been if he had remained outside. But what he sought to exclude when he entered the booth was not the intruding eye — it was the uninvited ear. He did not shed his right to do so simply because he made his calls from a place where he might be seen." This was a major case dealing with the All Writs Act, the law that the government is using to compel Apple's help in unlocking Farook's iPhone. Here, a phone company refused to comply with an order through the All Writs Act to install a pen register, which would record all numbers called from a certain telephone. "We do not think that the Company was a third party so far removed from the underlying controversy that its assistance could not be permissibly compelled. A United States District Court found that there was probable cause to believe that the Company's facilities were being employed to facilitate a criminal enterprise on a continuing basis. For the Company, with this knowledge, to refuse to supply the meager assistance required by the FBI in its efforts to put an end to this venture threatened obstruction of an investigation which would determine whether the Company's facilities were being lawfully used. Moreover, it can hardly be contended that the Company, a highly regulated public utility with a duty to serve the public, had a substantial interest in not providing assistance. ... The order provided that the Company be fully reimbursed at prevailing rates, and compliance with it required minimal effort on the part of the Company and no disruption to its operations." "It may well be that, in such circumstances, no effective means short of a search exist. But there is nothing new in the realization that the Constitution sometimes insulates the criminality of a few in order to protect the privacy of us all." "Regardless of the phone company's election, petitioner voluntarily conveyed to it information that it had facilities for recording and that it was free to record. In these circumstances, petitioner assumed the risk that the information would be divulged to police." "The Court must proceed with care when considering the whole concept of privacy expectations in communications made on electronic equipment owned by a government employer. The judiciary risks error by elaborating too fully on the Fourth Amendment implications of emerging technology before its role in society has become clear." Remember, the iPhone 5C that Apple is being asked to unlock was Farook's work phone from the San Bernardino County Department of Health. "Awareness that the Government may be watching chills associational and expressive freedoms. And the Government's unrestrained power to assemble data that reveal private aspects of identity is susceptible to abuse. The net result is that GPS monitoring—by making available at a relatively low cost such a substantial quantum of intimate information about any person whom the Government, in its unfettered discretion, chooses to track—may 'alter the relationship between citizen and government in a way that is inimical to democratic society.' "
"Modern cell phones are not just another technological convenience. With all they contain and all they may reveal, they hold for many Americans 'the privacies of life'... The fact that technology now allows an individual to carry such information in his hand does not make the information any less worthy of the protection for which the Founders fought. Our answer to the question of what police must do before searching a cell phone seized incident to an arrest is accordingly simple — get a warrant."